Det byrjar å seg haust no, det følest i alle fall slik når eg ser ut på regnet og at det var studiestart denne veka. Eg vart nyleg ferdig med ein vest i Lett-Lopi som vart bursdagsgåve til ei venninne av meg. Eg var litt redd for at vesten skulle verte for liten, men eg har sett han på, og han passar:) Mønsteret fann eg på istex.is. Since my last post, I've knitted a vest in Lett Lopi, that was a birthday present to a friend of mine. 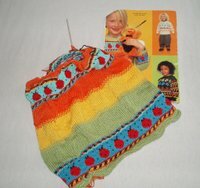 The pattern "Lett- Lopi vest"(ravelry) is found here. Eg byrjar på eit halstørkle av nokre rester med alpakka, mønsteret er inspirert av opprekkssjal i Nøstebarnboka.No har eg mor mi ynskja seg eit liknade til bursdagen hennar i neste veke, eg har byrja på eit lilla frå New Zealand lammeull. Eit anna mindre prosjekt eg elles held på med er Endpaper Mitts av Eunny Jang. I tillegg fekk eg Kim Hargreaves si nyaste bok og Purelife frå Rowan i posten går, inspirerar til strikkeprosjekt for hausten.Nett no prøver eg å finne ut om eg skal strikke Victoria eller Lovage. There hasn't been much time to blog lately, however I'm still knitting. So today, I thought I'll give you a short knitting update. My nephew's birthday is in june, and I've started on his birthday present. It is stripy raglan, the pattern is Rullegenser from "Strikk til nøstebarn" (Ravelry). I've used the Lerke from Dale. 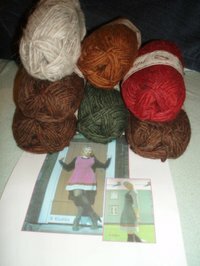 The yarn is a blend of cotton and merino wool (Ravelry). The yarn is really soft, and lovely to knit with. I'm still working on my Flutter Sleeve Cardigan, hopefully I'm done by the end of next week. It's still a joy to knit . 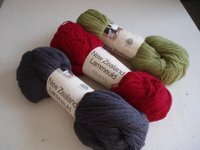 I've also bought some yarn which I'm going to knit Angle with for my niece. I can't decided which to colours to use. What do you think? Det har vore ei stund sidan eg har blogga no, men eg s trkkar framleis . Eg held på med Rullegenser frå "Strikk til Nøstebarn". Dette skal verte bursdagsgåve til nevøen min, eg testar i den samanheng ut det nye Lerkegarnet som er veldig godt å strikke med. Elles held eg framleis på med Flutter Sleeve Cardigan, men trur ikkje det tek så lenge før eg er ferdig. Elles har kjøpt litt garn frå 123knit til å strikke Angle med. Har ikkje bestemt meg kva for farge eg skal bruke saman med raud enno, får sjå. Tenkjer å lage ei kjole til å matche kontrastfarge på jakka, lurer derfor på å bruke raudt som kontrast. 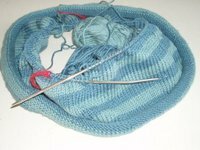 From the blog "The nerd and the needles", I read about a challenge Petunia posted on her blog. To sh ow the first thing you ever knitted or crocheted. So since I'm home on vacation I started to look through my old closet, to see if I could find any of early knitting projects. My first knitting project I couldn't find, neither the hats and mittens that I made at school. However I found some pieces from my early knitting years. When I was 10, my little sister was born. I remember knitting a pair of socks to her that accompanied the baby jacket my mother made. However didn't find them today, what I did find was a very colourful blanket. I started this project at school, and brought with me yarn home in order to do knitting homework. I remember knitting several pieces every day in order to get finished before she was born. The knitting part of the project wasn't that hard, but the part where I had to sew all the pieces together. And today I discov ered that I still haven't weaved in all the ends. 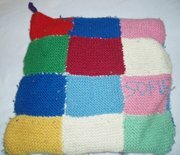 The blanket consist of 72 pieces, and some pieces was used to make a pillow for my sister which she used at kindergarten (they were all supposed to bring with their one pillow, I was quite proud she brought with her the one that made). My first sweater project was also for my sister. 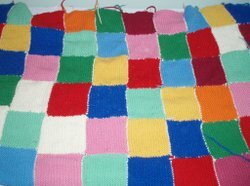 I started it when I was 12 years old, and you do notice that it's knitted by a child. I never finished the sweater. Why? Maybe because of all the colourwork, though I think it's mainly because I knitted this sweater in Kolbri (100% cotton, ravelry). This sweater it the reason to why I never knit with cotton yarn. 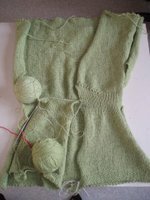 It's a bit sad that I never finished this sweater, cause I know I work very hard to get as far as did. 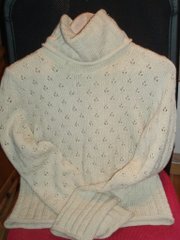 The first sweater I made for my self, was a result of a school project. For one week we were allowed to choose what we wanted to work with. I choose to knit a sweater. The sweater to me about a year to finish. The first week I did knit a lot, but because I mangaged to twist it, I had to start over:) It's knitted in Falk, and the pattern was from Dale Trend, a design line Dale of Norway had some years ago. I'm very satisfied with this sweater, and I it's worn often. Take the challenge, and show your first project.